Only 14 per cent of the capital’s Blue Plaques honoured women. 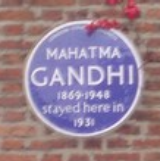 Of the 943 Blue Plaques - only 132 recognised the achievements of women. That date was the 100th anniversary of the 1918 General Election, when women first voted. To mark the importance of that event, the London Assembly launched a campaign to redress the gender balance of London’s Blue Plaques. The Kingsley Hall Community Centres Heritage Committee considered that Muriel & Doris Lester deserved such recognition and a nomination was submitted in the name of both sisters for their founding and work at both Kingsley Hall Bow and Dagenham. 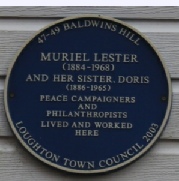 There is a “local” plaque on the home in Loughton, Essex where the Lester Sisters lived.